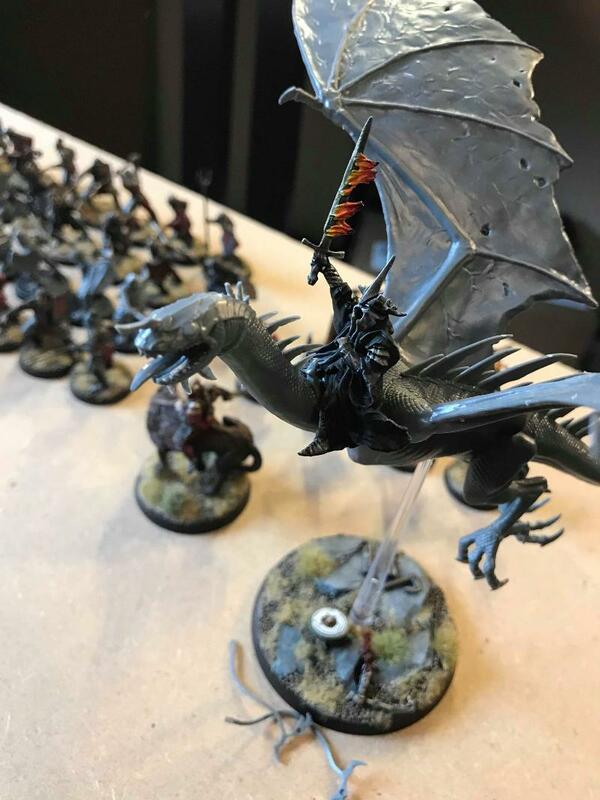 Seeing how this went very well in the Age of Sigmar forums, I thought I would try it here. I was finally able to get the new Lord of the Rings starter set. Last week I scored and found my old metal minis that I forgot about and in some cases didn't know I had and my lovely wife bought them for me ages ago. This is what I am starting with. Hopefully my depression will not get the best of me and I will be able to start painting and modelling on a consistent bases now. Here is what I am starting with. Let's see what everyone here is working on. Even if you don't have pics say what you are working on. Let's keep everyone motivated and show your progress or final pics. Good luck everyone. Looking forward to see what you have done. Nice collection of bits there. How are you going to fix Théoden's sword? Personally working on the Nazgúl of Dol Goldur currently. Love how easy they are to paint. 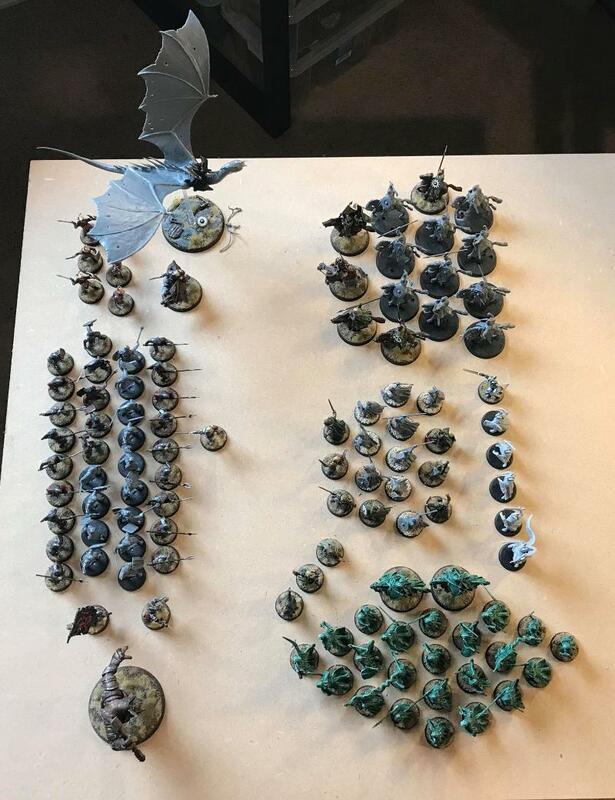 The numbers indicate how many are actually painted versus how many I've got. I'm now bogged into university plus work so my pace of work is going to rapidly slow down, but I'm really happy at how far ahead I've got and how much of the forces I've got actually painted. I've developed a lightning fast technique for effectively painting the Morannons, so that's helped. Look forward to seeing what everyone else is up to. 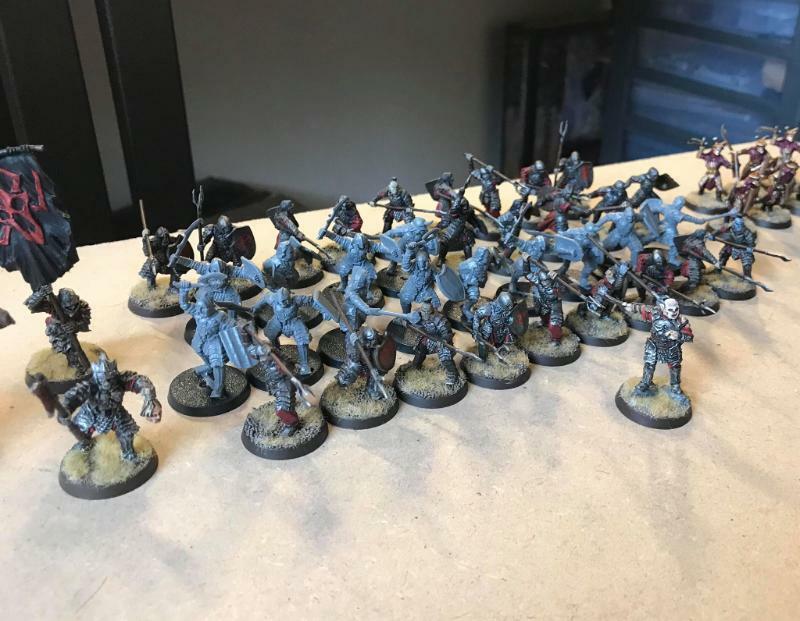 Assembled, converted, and painted up all these in a few days last week. Now I'm working on a Cirith Ungol Black Uruk force led by Shagrat. Inquisitor Gideon wrote: Nice collection of bits there. How are you going to fix Théoden's sword? I don't have a clue yet. I am hoping when I go through all my plastic bits from Mines of Moria I might see something there I can use to fix the sword. I am surprised they way I neglected these minis, it's only one broken sword. You could do a headswap, cut away the scabbard and drill out the hilt and make an alternative standard bearer. Just about there with my High Elves army. 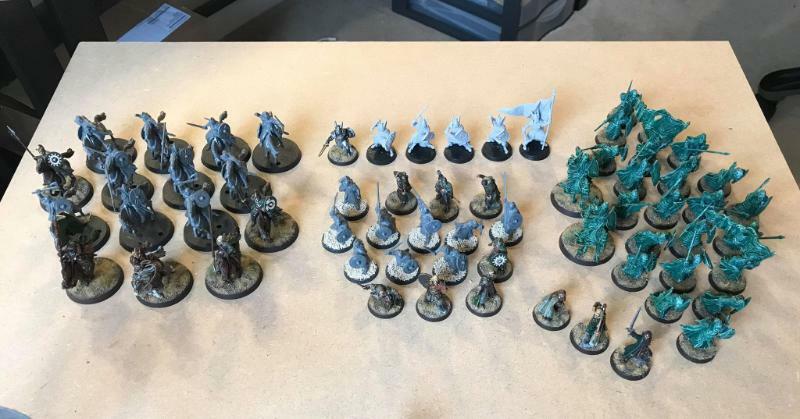 I've gotten the Infantry and most of the Heroes sorted, and now I've only got 4 Rivendell Knights and mounted Elrond left to do for my 800pts list, which I'm hoping to finish by the end of the month (and then get started on my spooky scary Angmar project). Wow - what a beautiful army you've got there. And the bases really round them off too. Stunning work. Great work Haanz. Thanks for sharing. I am worried now about posting my finished product. LOL. Too many things on my desk right now so I'm working on prioritizing. 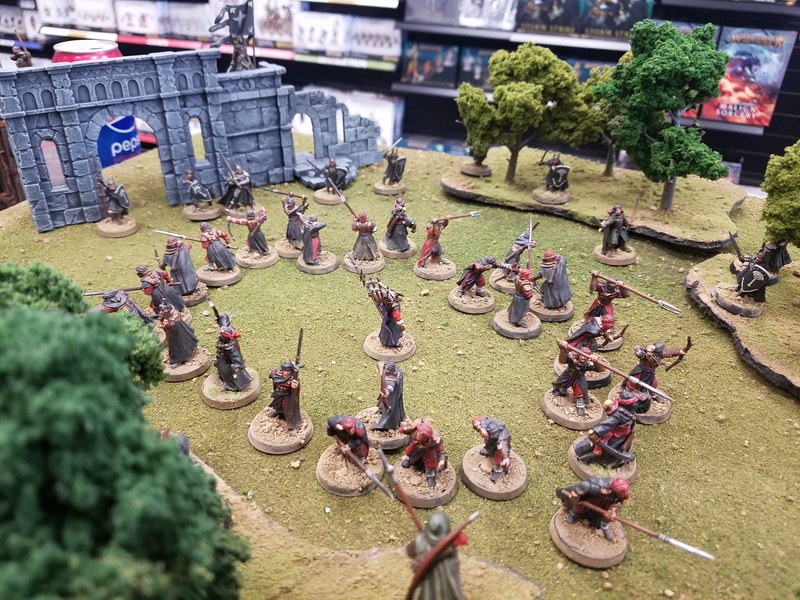 Mordor and the Grey Company are first into the queue since they should be relatively straightforward (unless I decide to start freehanding the Eye onto some shields), will post some pictures later on. I'll wait until I can afford the rulebook and army book...in other words when the PDF's are on the net. If you're trying to use the ruleset for historical purposes you can get away with older versions of the book just fine, most of the changes in the new version are to magic and specific unit stats. Please, hide your pics under spoiler tabs. 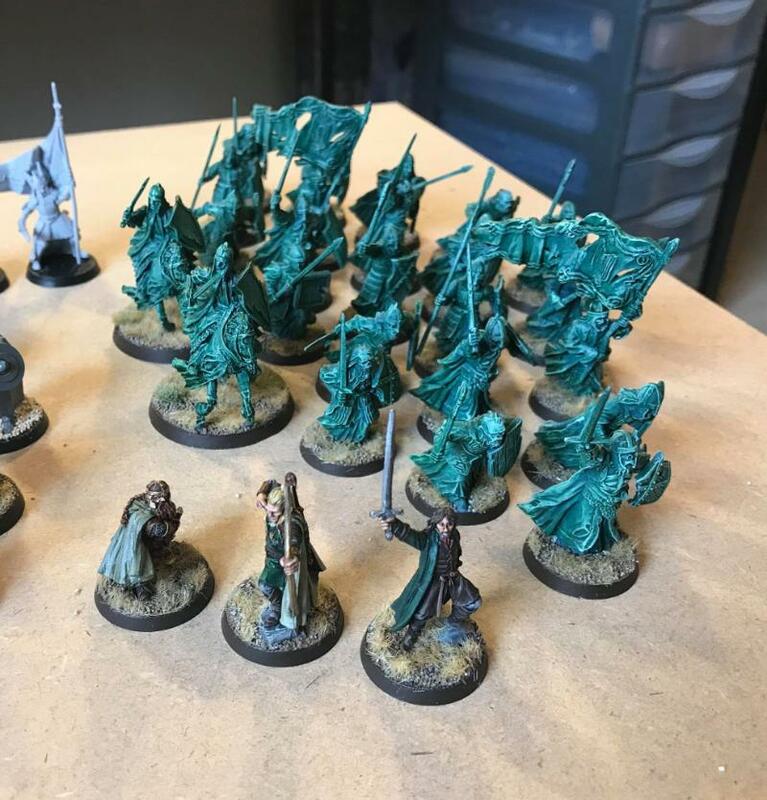 In the last week, got my Cirith Ungol force assembled and about 95% painted. should finish them up tonight. That's looking awesome, judgedoug! Great theme, very morbid. The shields add a lovely spot colour too without overbrightening them or taking away from the muted, miserable palette. Wow great job there judgedoug. Thanks guys! They are finished, awaiting a matte coat. I will get some more pics and post them tonight or tomorrow. 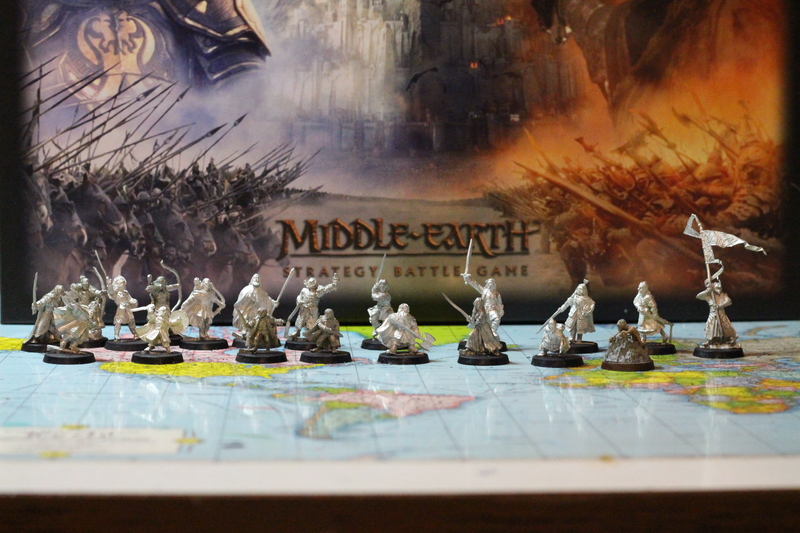 The Knights of Rivendell are now finished, putting my Rivendell army somewhere in the region of 1000pts. All I need to do now is paint Mounted Elrond, and I'll have everything I need for my planned 800pts army - still a whole load of bits and bobs to do (Glorfindel foot and mounted, Arwen mounted, alternate Elrond, and I've got about 4 each left of the other types of Elves, and I'm still unsure if I'm not going to go back and add Elven Shields to my two-handed blade guys) - but none of this is super-mandatory for the short term, and I've got a whole Angmar force to paint next and some eBay Goblins to rescue for some Mines of Moria scenario play. Those look superb, you should be so proud of them. As I mentioned before the bases in particular are just terrific and match the beautiful aesthetic of the elves themselves. You're tempting me down the Elven rabbit hole which I have no time for!! On my side of things, I finished another 5 Morannon Orcs (have developed a super fast technique for them), the Witch King plus his base (no beast yet), and the single Knight of Dol Amroth. 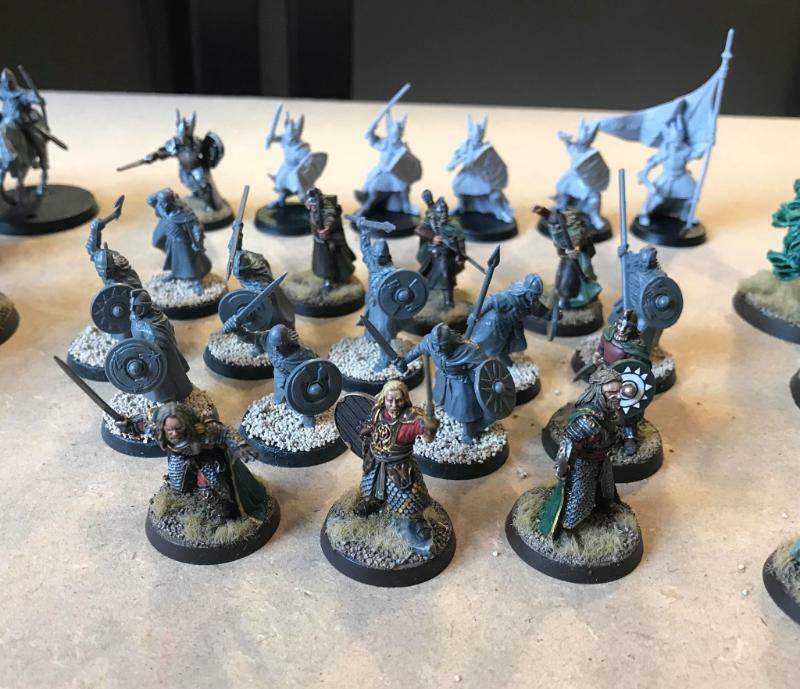 So far my expanded Pelennor Fields armies are an ongoing WIP and are seen below. There are a bunch of closer pics in the spoiler! Awesome job, Oppl! Everything is looking amazing so far, and your cohesive basing is just absolutely perfect for Pellanor Fields! My armies on Parade. It's not amazing, but it's still decent. These look awesome, keep up the good work man. I've gotten the new boxed set primed, but got distracted by a different project. Will be getting back to SBG soon enough I hope. Lovely stuff sledgehammer, those old Numenorians are still some of my favourites. There's an old metal Captain with sword in there, isn't there? The Numenorians (as part of a wider Last Alliance revisit) is one area I'd love GW to redo. Hopefully they'll cover it as they work through the movies. Great job there Sledgehammer. They are really good. Great work, Sledgehammer! 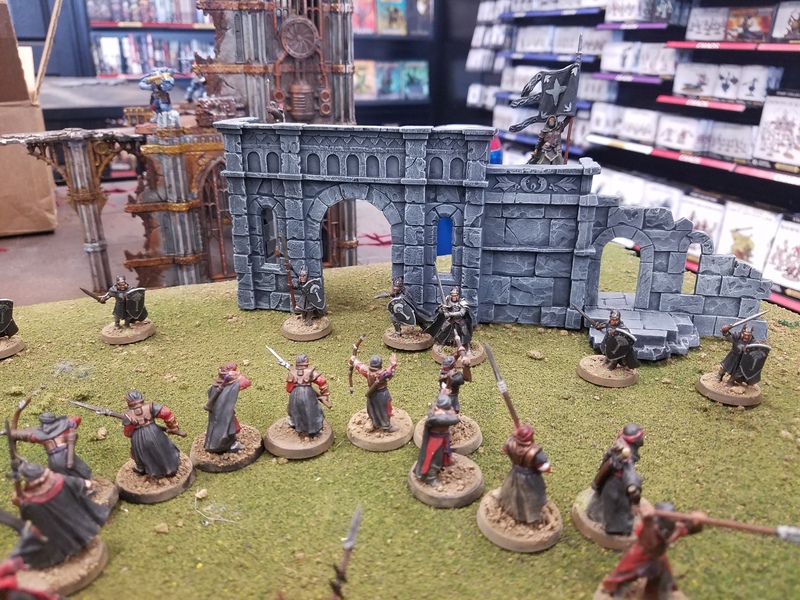 Always great to see SBG getting repped in Armies on Parade. 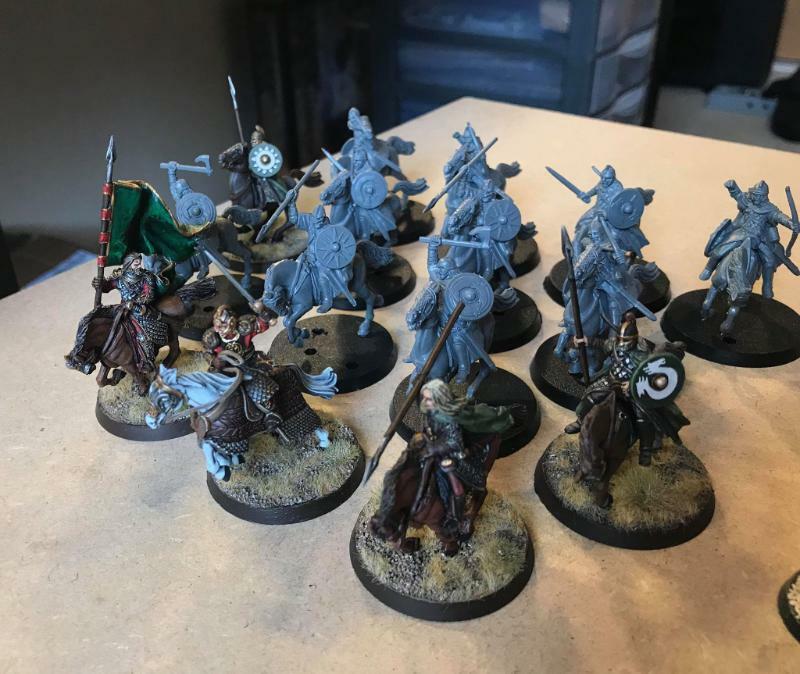 My next update - I finished Mounted Elrond, meaning I've finished my 800pts Rivendell list now! This isn't the end of this project.. but it is a reasonable breathing point to stop and go mix it up a bit with another force. 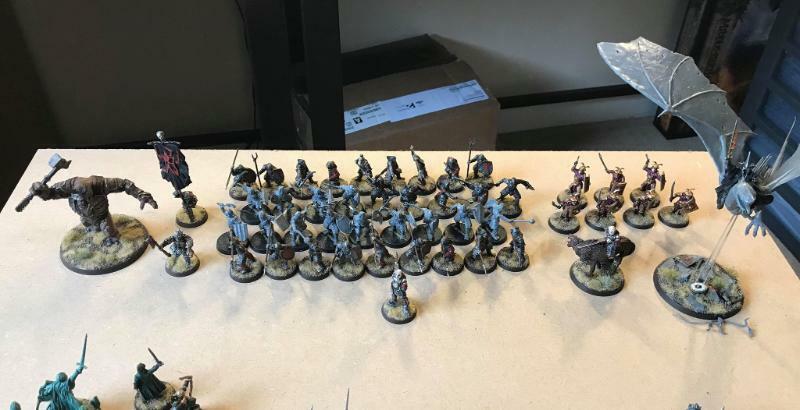 I still have a bunch more infantry I could paint and add to (and I'm considering converting some sword and shields, bow and shields, etc), plus an old unarmoured Glorfindel (both on foot and mounted) and a mounted Arwen I'd like to get to sometime - I might wait to see what GW re-release though, as I'd rather like an Armoured Glorfindel, Erestor and a Cirdan to add! 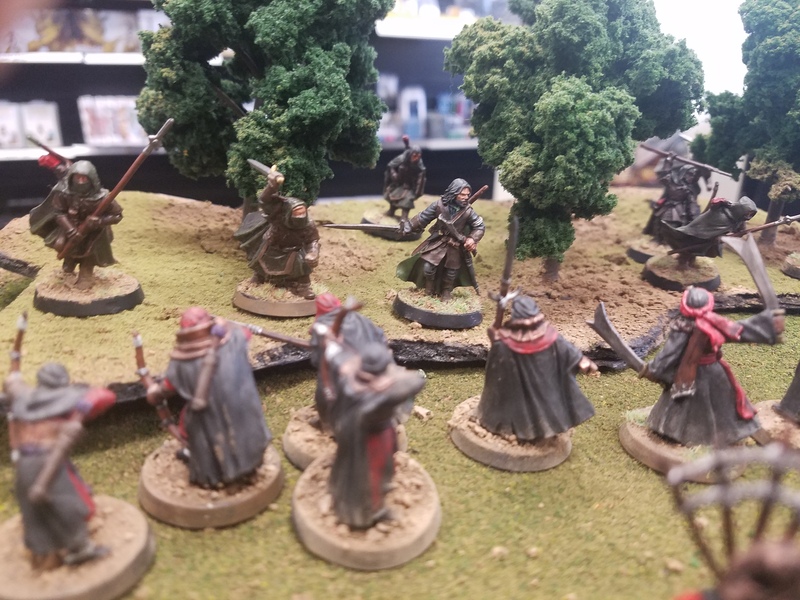 To celebrate finishing up my 800pts of Rivendell, I knocked out a quick 500pts start to my Angmar force over the weekend. 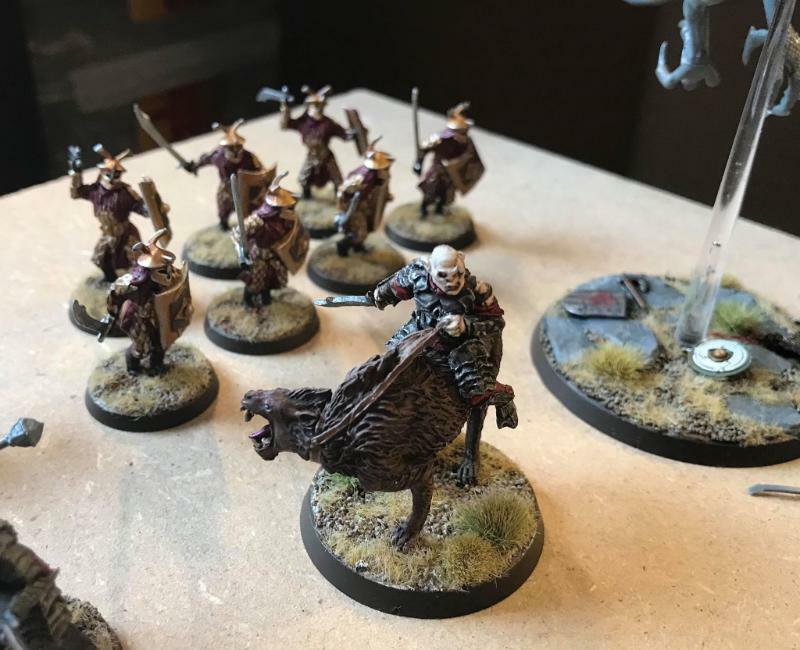 36 Orcs, 2x Barrow Wights, 3x Dead Marsh Spectres, a Shade and the Witch King in his Twilight Form, which, although I generally prefer the Black Rider look (and I'll definitely be adding named Ringwraiths and a Fell-Beast later on), I thought really fitted the aesthetic of the spooky scary Ghosts of Angmar theme better, and so he made the cut for the token solitary foot-slogging Ringwraith. 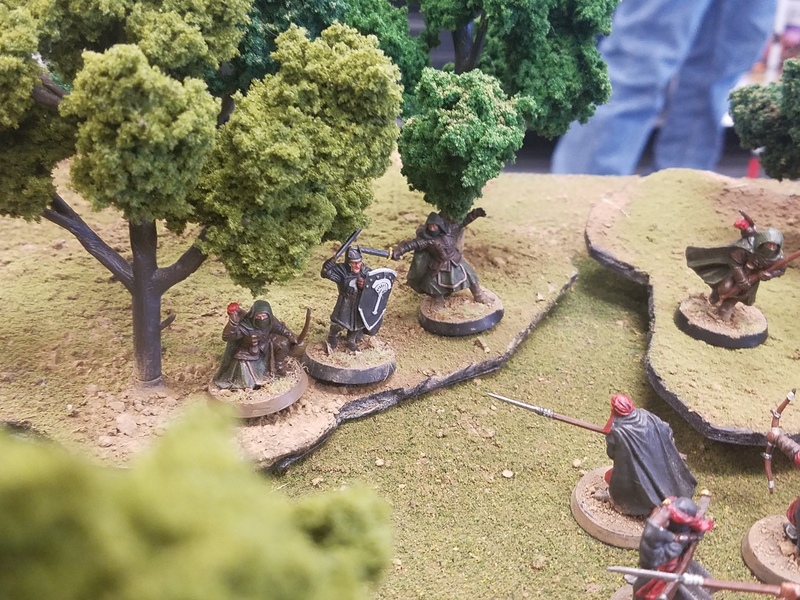 Next up for the army is the other side of Angmar - Hill Trolls! I've got Burdhur and the three different metal Cave Troll sculpts to do next, which will do for the army for now. After Christmas, I'm hoping to add a couple of big scary monsters like Gulavar or a Fell Beast, as well as the Tainted and Dwimmerlaik. Finished the Dol Goldur wraiths, now about 4/5ths done on the second beast. 7 1/2 orcs to go. The picture has drowned out a lot of the highlights, but you get the idea. That's a great looking Great Beast of Gorgoroth, Gideon! Love the model, and you've done a terrific job with it! Here's the latest addition to my Angmar force - Burdhur, Hill Troll Chieftain and one, two, three Cave Trolls to back him up! Pic didn't show for me Haanz. some of the projects i've been trying to get finished. Uni work is getting in the way though.